TREE GODDESS! 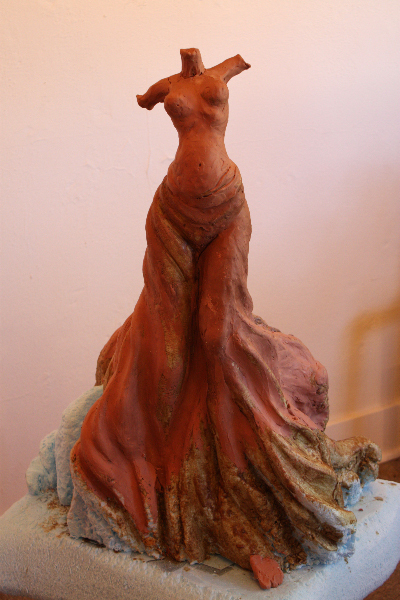 Come see a bronze in the making, Bill’s creation of a woman born of tree. The sculpt will soon be ready for a mold, and then poured as a bronze by renowned artist/sculptor Huberto Maestas. When she’s completed, the TREE GODDESS will be placed on the pedestal in front of DURYEA FINE ART, 1003 Manitou Avenue, Manitou Springs. Along with wonderful giclee prints (digitally scanned and professionally printed) of some of Bills favorite works, we are featuring giclee-imaged greeting cards (5×7″) of The Star Tree and other paintings. National Scholastic Magazines National Art Award, Honorable Mention, Pen and Ink, 1972. Colorado Springs Fine Arts Center, New Heights: A Regional Juried Art Exhibition, watercolor, 1994. Colorado Springs Fine Arts Center, Colorado 96, A Statewide Juried Art Exhibition, color photography, 1996. Human Touch Gallery, Manitou Springs, Colorado, Lust for Light: An Exhibition of Luminous, Open-air Oil Paintings, one-man show, 24 oil paintings, 1999. Bill grew up in a Colonial ship captains farmhouse in Middlebush, New Jersey. Antiques and the lore of the past became grist for the creative mill. He and the fields and the endless woods became intimate friends. Bill studied fine art at Pratt Institute in New York. He worked as a textile designer for a large corporation in New Jersey while pursuing his fine art career in his spare time experimenting with watercolor, mixed media, oil color, pastel, pen and ink, photography and sculpture.